From a seasoned professional: “flip your ID Badge so AUTHOR doesn’t rub in the face of anybody.” My guess at the best badge name? INTERNATIONAL RIGHTS BUYER. Everyone loves an international rights buyer. By size of space and position in the hall, Hachettes is the biggest company in the UK. They occupied what looked like a giant wedding cake building with a balcony for its top layer. As Innocents Abroad me and an amigo wandered up there and found ourselves donuting Hachette’s big hitters as they delivered speeches on new imprints, profit flows and how much they loved their authors. Their champagne was very high quality, the best of LBF. Branding is another way money is made from a book, especially a book with a well known character. It takes around five years public profile before a book’s suitable for branding. Kids’ books are the leaders here (Elmer The Elephant slippers anyone?). These rock star head mics are all the rage. Judith Kerr, the venerable author and illustrator is an absolute star and took to the head mic like a cat to catsnip! Just because people are standing up doesn’t mean they are not in a meeting. Seats can be expensive. ‘35,000 first print run’ is a typical overheard line of conversation. Authors HQ is where all the self/unpublished authors gather. Amazon Direct Publishing and the like cannily park themselves next door. Authors pitching to Agents is car crash territory – like the auditions scenes in Peter Kay’s UK TV series, Phoenix Nights. If you didn’t laugh, you’d cry. Mostly you cried. How people pitch has got nothing to do with the quality of their book. Pitching is a skill that probably requires a week long course to get anywhere near good at. £1 to park your bag in the basement is a bargain. LBF had about sixteen miles of stalls on at least three levels. Trundling around with a flight bag soon wrecks your back. Powerpoint is both utterly fabulous and indescribably dull. I saw one sign language tag team – working at the ‘Festivals’ talk. They were brilliant. 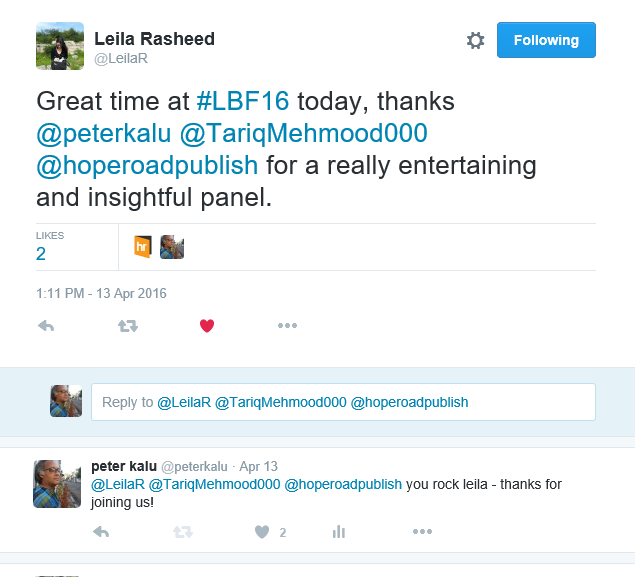 Miracle of miracle – I was actually approached by a publisher who recognised me while I was wandering around and asked me to submit some work. 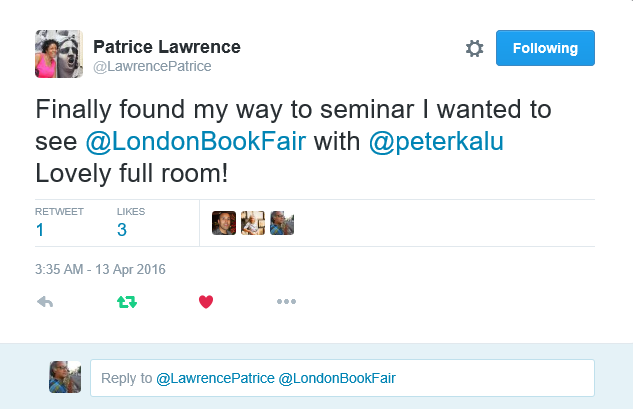 Most friends I bumped into there had guilty grins on their faces – either through the free wine or because if you’re into publishing then to be at LBF is to be Alice in Wonderland. Business is still conducted in suits – there are no Steve Jobs style black polo-necks or Mark Zuckerberg grey T’s at top publishers’ tables. If I owned a mobile coffee stand I could have made a killing outside the venue. 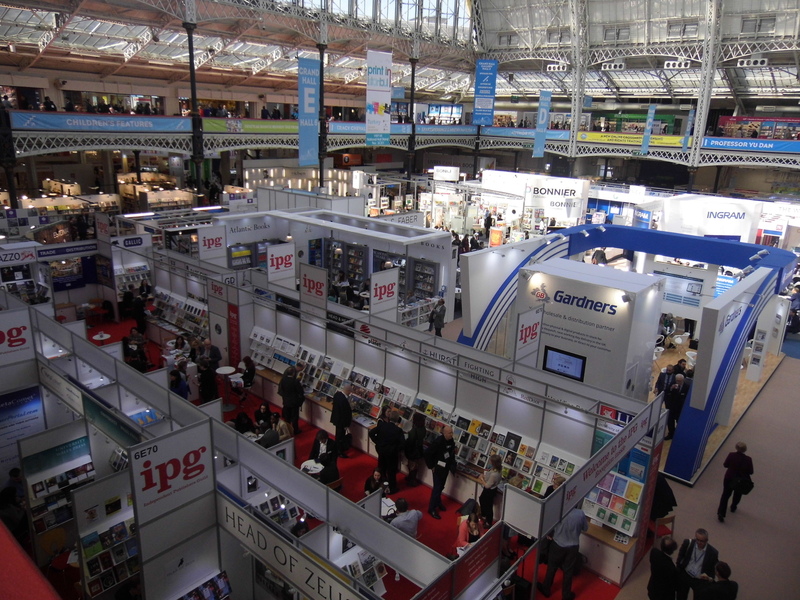 Turnaround Distributors Stand was buzzing – hopefully good for leftie & diverse book sales. PEN International had a fantastic spot where some of the best author-to-author conversations were held. The veteran publishing professionals are generous, witty and perceptive- they can decode you in the blink of an eye then give relevant advice. 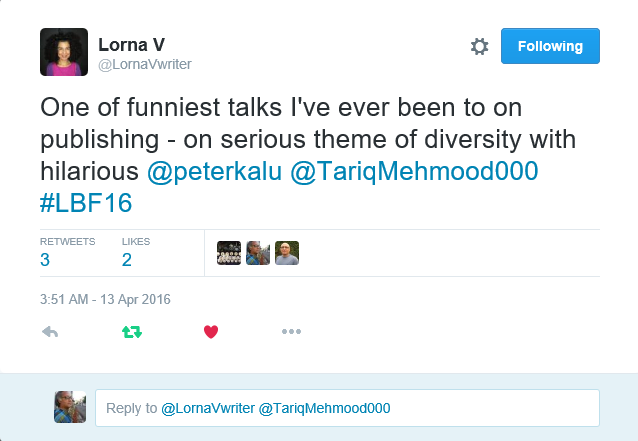 The UK publishing industry itself is a sea of white. Even the music publishers’ stalls (sigh) were 100% white folk. 11.30am -12.30pm Club Room Wednesday 13th April: What’s In A Name? Creating characters for the 21st Century YA novel. We expected 20 people. Over 200 people crammed into the Club Room. How did it go? The tweets above catch the spirit. Were the streets paved with gold? Probably – for the international rights buyers!